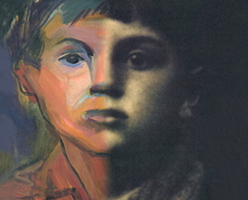 In this activity, students will work with primary sources, photos and survivor video testimonies, to think about the topics of family, connection, and loss through the lens of survivors of the Holocaust and through the process of creating visual art. By completing this activity, they will learn about the Holocaust from personal stories and actively reflect on the meaning of those stories as an act of resilience, or the ability to overcome adversity. The activity is based on the program and techniques of the Memory Project Productions.